I struggled with anxiety, digestive issues, and sleep disturbances for a long time. was helping me to deal with these struggles and to feel more joy and ease in daily living. began incorporating Ayurvedic principles to all of my teachings. and I am excited to share what I have learned along the way. Deborah is a graduate of the Kripalu School of Ayurveda and is a Certified Ayurvedic Consultant, A Certified Ayurvedic Yoga Specialist and a RYT500 Yoga Teacher. She has been conducting classes and workshops and has consulted on an individual basis for more than 30 years serving over 1000 people. She appeared in the April 2000 issue of National Geographic Magazine and was chosen to be profiled in the Kripalu Center for Yoga and Health Spring 2010 catalog. 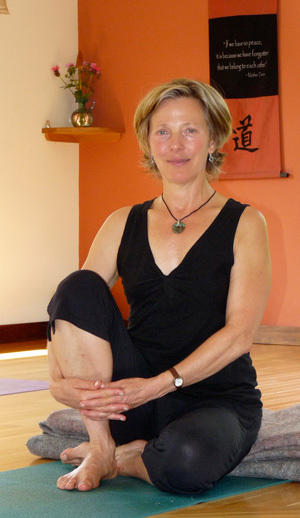 Deborah is the owner and founder of the Ayurveda Yoga Center located in Liberty, Maine. She is known as a spirited, down to earth teacher who speaks from her heart. She combines her humor, compassion and easy manner in all of her offerings. Her heart-based teachings, which are deeply influenced by nature’s cycles and rhythms, encourage inner listening along with body, mind and spirit practices. My love for the natural world and holistic health began 47 years ago when I was a 15. My dream of bringing Yoga and Ayurveda to the community where I live was realized in 1998 when my husband and I built a Yoga Studio/Barn on our property which remains to this day the home of the Ayurveda Yoga Center. I have had the great fortune to study with some of the word’s most esteemed teachers including T.K.V. Desikachar, Erich Schiffmann, Patricia Walden, Dr. Scott Blossom, Dr. Vasant Lad, Dr. Claudia Welch, Dr. John Douillard, Dr. Jay Apte, Dr. Sunil Joshi, and Pratima Raichur. My work has been greatly influenced by these as well as many other highly regarded teachers. 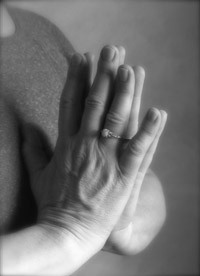 Over the past 34 years I have applied the teachings and practices of Yoga and Ayurveda to my own life. I have slowly made dietary and lifestyle changes to support my own unique mind/body type. I have experienced firsthand the differences these changes have made in my mood, the way I look, the way I feel, the energy I have, how I am in the world, and how much more joyful and at peace I am. I have dedicated most of my life to the studies and practices of India’s healing systems and I continue to feel that it is my life’s purpose to share what I learn along the way. I remain committed to helping others realize their beauty within so they can feel the joy and ease which is their birthright. Please contact me to schedule a complimentary 20 minute session to see how I might be able to help you begin your own journey toward living a happier, healthier life. With great respect and gratitude, I give thanks to all of my teachers which includes my family, friends, and those who come to study with me. It is an honor for me to share some of my knowledge and experience of Ayurveda and Yoga with you. It is my sincere wish that you all may benefit in some way.